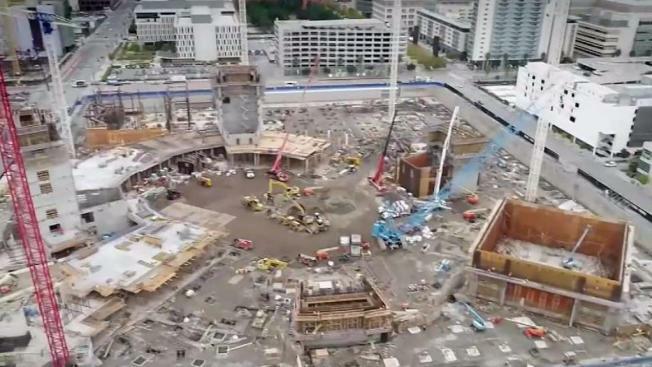 Construction for the roughly billion dollar Golden State Warriors arena in San Francisco continues to fall short of a city-instituted hiring goal aimed at increasing jobs for small businesses. In key redevelopment areas of San Francisco, construction firms are required to make a “good faith effort” to dole out at least 50 percent of the work on their projects to small businesses. The policy was part of the deal the Warriors struck in deciding to move across the bay from Oakland. With roughly 85 percent of construction already assigned for the Warriors arena, small businesses only account for 18 percent of the work, according to data from the Office of Community Investment and Infrastructure, the agency tasked with enforcing the city’s small business hiring policy. Of the work that's assigned to small businesses, less than half went to San Francisco-based companies, which are supposed to receive preference during the bid process. Less than 2 percent of arena work has been awarded to minority-owned small businesses. With the vast majority of construction already assigned, nearly $850 million worth, the Warriors have little room to improve their figures moving forward. Hardcastle was originally selected as a subcontractor to help install sprinkler systems on the project. Just before construction began, however, Hardcastle said his small business was benched. “We’re perfectly capable of performing portions of that project and we do work like that every day,” he said. The NBC Bay Area Investigative Unit viewed an email from Mortenson/Clark, the prime contractors on the arena. That email, sent to some of the large companies already hired to work on the project, noted the Warriors decided not to pay the extra money needed to hire small businesses for portions of the arena’s construction work. Hardcastle said soon after that email went out, his small business was cut from the Warriors arena project, costing his company between $250,000 and $300,000 in profit. Currently, there are no small businesses doing any work on the arena’s sprinkler system, a contract valued at more than $13 million, according to city records. Hardcastle acknowledges that hiring small businesses can be more costly because larger companies can buy materials cheaper, but he said that cost of doing business is what the Warriors agreed on when the team chose to move back to San Francisco. “I don’t know how they could not have anticipated there would be a cost involved in it from day one,” he said. Mike Hardcastle, owner of H & M Fire Protection Inc., said his small San Francisco based company was shut out of doing work for the new Warriors arena (Nov. 2, 2017). Last January, in the midst of the team’s celebratory groundbreaking on the arena, Warriors President Rick Welts told NBC Bay Area the team would meet the city’s hiring requirements. “We have confidence that the city’s guidelines are going to be completely focused,” he said. Despite the Warrior’s inability to meet the city’s hiring goal, the team maintains it has complied with San Francisco’s hiring policies since it believes it went above and beyond in attempting to achieve the benchmark. Click here to view the Warriors’ complete explanation of the team’s “good faith efforts” to hire small businesses. “I’m disappointed to find out that their numbers are this abysmal,” said Matthew Ajiake, President of the San Francisco Bay Area Small Business Council. Ajiake said an organization that has been so spectacularly successful should be able to figure out how to increase the amount of small businesses working on the project. Ajiake, who also serves on the board of the San Francisco African American Chamber of Commerce, said he is especially disappointed the Warriors hired minority-owned small businesses to complete just 1.4 percent of the arena’s construction work. During a 2013 meeting between the Warriors and the African American Chamber of Commerce, Ajiake said a team lawyer assured him the Warriors were committed to partnering with small and minority-owned businesses. With roughly 15 percent of the project still unassigned, Ajiake hopes the Warriors will commit to hiring more small businesses. The Warriors are not the only entity failing to meet the city’s small business goal. According to data from the Office of Community Investment and Infrastructure, developers consistently fail to meet that threshold. Across all current construction projects in San Francisco subject to those hiring goals, small businesses only account for 35 percent of the work. The hiring policy, which has been in place since 2004, is supposed to help small businesses compete against major construction projects in the city’s key development areas, such as Mission Bay and Transbay. Increasing their involvement in major construction projects allows small businesses to gain experience while also growing their companies, according to Ajiake. Matthew Ajiake, President of the San Francisco Bay Area Small Business Council, said the Warriors assured him they were committed to partnering with small businesses (Feb. 5, 2018). NBC Bay Area made several interview requests with the Office of Community Investment and Infrastructure, but the agency declined. In a statement, the agency said it monitors whether developers actually make a genuine effort to meet the city’s hiring goal. “If OCII disputes a contractor’s good faith efforts and a remedy was not agreed upon, OCII would issue a notice of non-compliance and this would be resolved by arbitration,” a spokesperson for the agency said in an emailed statement. During arbitration, a company can be hit with fines of up to $50,000 or have its contract suspended if it’s determined the company did not comply with the city’s policies. However, the agency says it has never taken any such disciplinary action against a company for failing to make a “good faith effort” to meet the city’s small business hiring goal. He fears small businesses will never be given a fair shot unless San Francisco takes stronger action against developers who consistently fail to meet the city’s own goals. Ajiake said he’d like to see the mayor and board of supervisors consider fining developers who don’t meet the 50 percent hiring goal. That money could then be used to help small businesses.